CLEVELAND (AP) — Trevor Bauer shut out Chicago for seven innings before a rain delay ended his night, and Jason Kipnis homered to lead the Cleveland Indians to a 6-2 win over the sliding and sloppy White Sox on Monday. Perez’s two-run, ground-rule double highlighted Cleveland’s three-run second inning, which was set up by Chicago second baseman Yoan Moncada‘s fielding error. 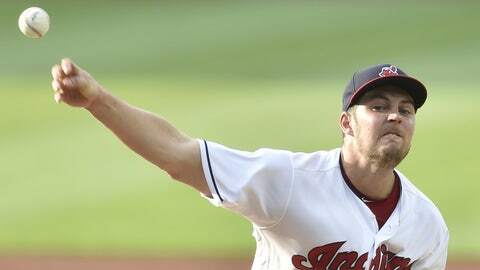 Kipnis made it 4-0 with an RBI single in the third, and he hit his fifth homer in the fifth to put Cleveland up by five over Covey, who came in 3-0 with a 1.53 ERA in his previous five starts. Indians: OF Bradley Zimmer will undergo an MRI on his right shoulder. Zimmer felt discomfort while throwing after he initially strained the shoulder while doing drills after being sent to Columbus to work on his game. “I don’t think he thought it was anything, and it just didn’t feel good. So, we’re going to go ahead and get him looked at,” Francona said.